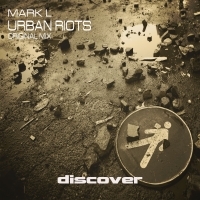 Mark L steps up to the Discover plate with this stunning single track release Urban Riots. Expect driving basslines, distorted fills, hypnotic vocal samples, plenty of acid action and and infectious main hook line. The breakdown is hard fierce trance at its best and is blissfully unrelenting. A great builder of a track from the word go. 'Urban Riots' is available now from Beatport and iTunes.